The JR East network covers the Tokyo metropolitan area and extends north and east of Tokyo including the route around Tohoku (see pp318-53 in Japan by Rail) as far as the northern tip of Honshu; it does not include Hokkaido. The main passes include travel on the Narita Express (N’EX) from Narita Airport and the Tokyo Monorail from Haneda Airport. 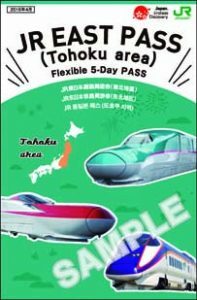 They are also valid on Tobu Railway’s Limited Express services to Nikko. Some of JR East’s passes are also valid to places covered in the Central Honshu section such as Matsumoto, Atami and Odawara (though for the latter not using the Tokaido shinkansen), and on some private lines such as the Izu-Kyuko line to Izukyu-Shimoda (for Shimoda). 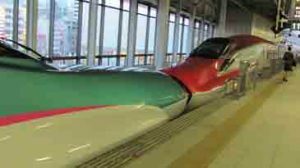 A seasonal option (Apr-Nov) available with any JR East pass is the Tateyama Kurobe Option Ticket (see p184). 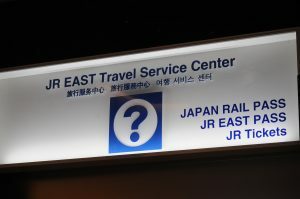 JR East passes are only available for Ordinary Class. The prices in brackets are for rough guidance only and are based on the exchange rates quoted in the 4th edition of Japan by Rail. The exact cost will depend on the exchange rate used by your rail pass agent at the time of purchase. It’s worth shopping around as agencies apply different exchange rates. See Updates and news for conversion equivalents on 12th April 2017. For full details of all passes (JR East also offers passes in conjunction with JR West and JR Hokkaido) and a full route map see JR East‘s website. This pass is valid for 5 days’ travel in 14 days and costs ¥19,000 (£119/$167); if bought in Japan it costs an additional ¥1000. In addition to the network area outlined above the two main other lines this pass is valid on are the Iwate Galaxy Railway (Morioka to Metoki) and Aoimori Railway (Metoki to Aomori). It is also valid for reserved seats in the Hayabusa and Komachi shinkansen – and of course all the other shinkansen in the region. Note that this pass is not valid on the Hokuriku/Nagano shinkansen beyond Sakudaira, nor is it valid on any JR buses. 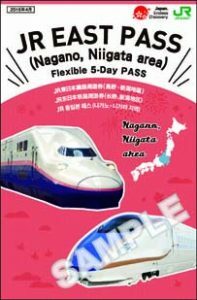 The pass can be bought through some of the agents listed in Japan by Rail (pp36-9), online through the JR East website, at Narita and Haneda airports, or at Travel Service Centers in the JR East area. Exchange vouchers can be exchanged for a pass at Travel Service Centers in Narita and Haneda airports as well as at certain travel service centers and information counters at stations in the JR East area. The following is a suggested itinerary but there are many other possibilities. Day 1 Spend day in Tokyo. Day 2 (Travel day 1) Take a shinkansen to Utsunomiya and change to the JR Nikko Line for Nikko, home to the opulent Toshogu Shrine. Day 3 Spend day in Nikko. Day 4 (Travel day 2) Return to Utsunomiya and pick up the shinkansen to Ichinoseki. Day 5 Have a day trip to the temple town of Hiraizumi, a compact town with some historic temples in scenic surroundings; return to Ichinoseki for the night. Day 6 (Travel day 3) Take a shinkansen to Akita (you may need to change train at Morioka) and consider stopping en route at Tazawa-ko, to see Japan’s deepest lake, or at Kakunodate, a former samurai town. 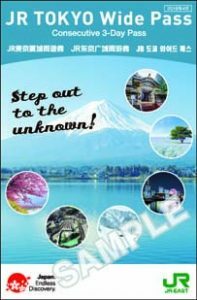 Day 7 Have a day trip to Senjojiki (or beyond) on the Ou Line (Hirosaki to Kawabe) and then on the Gono Line (between Kawabe and Senjojiki). The Resort Shirakami train operates on these lines at weekends/in holiday periods. Day 8 Akita to Aomori, Honshu’s northernmost city, best known for the Nebuta Matsuri (Nebuta Festival) in August. Day 9 Spend day and another night in Aomori. Day 10 (Travel Day 4) Take a shinkansen from Shin-Aomori to Sendai. Day 11 Day trip either to Matsushima, one of the top three scenic spots in Japan, or Yamadera, a hillside temple. Day 12 (Travel Day 5) Sendai to Tokyo by shinkansen. Days 13 & 14 Spend remaining time in and around Tokyo. This pass is valid for 5 days’ travel in 14 days and costs ¥18,000 (£112/$158); if bought in Japan it costs an additional ¥1000. Days 1-3 (inc Travel day 1) Same as for Tohoku Pass (see above). Day 4 (Travel day 2)</b> Return to Utsunomiya, take shinkansen to Tokyo and then to Nagano. Days 5 & 6 Visit Zenko-ji temple in Nagano and the snow monkeys in Jigokudani Monkey Park. Day 7 (Travel day 3) Travel from Nagano to Takasaki and then to Niigata by shinkansen; stay in Niigata. Day 8 Have a day trip to Dewa Sanzan; three sacred mountains, a popular pilgrimage place. Day 9 (Travel day 4) Return to Tokyo. Days 10-12 Tokyo and around including Narita, Kawagoe and/or Kamakura. Day 13 (Travel day 5) Day trip to Matsumoto or Izukyu-Shimoda (for Shimoda). This 3-day pass costs ¥10,000 (£62/$88) and permits unlimited travel in the Tokyo metropolitan area as well as Ordinary Class travel on JR East’s shinkansen (except the Hayabusa and Komachi services) from Tokyo to: Sakudaira (Nagano shinkansen), Echigo-Yuzawa (Niigata shinkansen); and to Nasu-Shiobara (Tohoku shinkansen). It is also valid on some private lines. In effect this pass covers everywhere shown on the Around Tokyo map in Japan by Rail, other than the Hakone region. The designated area includes: Nikko (JR or Tobu services); the Kawaguchi-ko area; Kawagoe; to Odawara (for Hakone) but not on the Tokaido shinkansen; to Izukyu-Shimoda (for Shimoda); Kamakura; Yokohama; Narita and Haneda airports; the New Shuttle line (to the Railway Museum from Omiya). In the ski season it is also valid between Echigo-Yuzawa and Gala Yuzawa (see box p352 in Japan by Rail); pass-holders are entitled to some discounts at the resort. If this pass is used on shinkansen services on one day at least and you don’t mind doing day trips rather than staying over it would provide excellent value, It means you can be based in Tokyo for several days but do a lot of sightseeing and then possibly only need a 7-day Japan Rail Pass for a 14-day holiday in Japan.